Only recently have I discovered for myself the amazing benefits of argan oil. I'm talking the proper stuff; pure, organic, 100% unrefined, cold pressed oil from the nut inside the fruit of the Argan tree. None of that nonsense from brands like "Moroccan Oil" that contain only minimal amounts of actual argan oil and are filled with silicones, artificial preservatives and fragrances instead! The oil itself is considered to be rare, as Argan trees only grow in Morocco and they don't start producing fruit until they're 30-50 years old. The production of argan oil is still mostly done traditionally, managed by co-operatives of women. It takes about 3 days for one woman to crush, grind and press the nuts to produce just one liter of oil. This makes it one of the most expensive oils, which is why it's often referred to as "liquid gold". 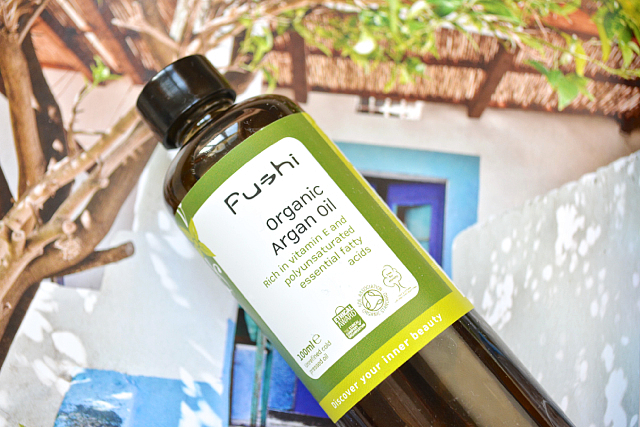 I use Fushi's argan oil (100ml RRP £12.00) which is sourced from co-operatives and is certified organic by the Soil Association. This particular oil is non-deodorised which retains the efficacy of the oil, so it has quite a strong nutty scent (don't worry, the scent does fade away when used on hair/skin)! Argan oil, or Argania Spinosa if you like the scientific names, has some fantastic properties, making it easy to understand why it's in high demand. One of the most notable properties is how intensely moisturising it is. It's rich in vitamins E and A which help ward off free radicals (unstable molecules that are highly reactive and cause damage to surrounding molecules), which in turn helps protect against fine lines and wrinkles. Argan oil can also boost circulation and cell renewal and it can even be used in food dishes, like as a salad dressing! When taken internally, it can help reduce cholesterol, stabilise blood sugar levels and balance the digestive system. Some pretty amazing and diverse benefits! This is easily my favourite way to use argan oil. After washing my hair, I use about 5-6 drops of oil through the lengths and ends of my hair to add moisture, tame frizz, add shine and to protect against heat styling. I have long hair though, so make sure you use only use 2-4 drops if you have shorter hair as it can weigh you hair down if you use too much! You can also use a more generous amount of oil for an overnight hair and scalp treatment. I don't do this very often personally, but you can massage a couple of drops of the oil onto your face and neck as a moisturiser after cleansing. It's a light oil so it doesn't feel greasy on the skin and absorbs quickly. It also works really well as an all over body lotion after showering, protecting the skin's elasticity which can help prevent stretch marks. If you have dry hands, argan oil is a great remedy. I also use it as a cuticle oil to soften, encourage nail growth and generally keep them in good condition! Do you use argan oil as part of your beauty routine? What's your favourite way to use it? I've been tricked by Morrocan oil but now only use organic argan oil just like you! Argan oil can weight the hair down but not so much as coconut oil. Anything more than a pinch of coconut oil will leave my hair in strands. I think I might switch to using this instead of Ojon Rare Blend Oil. Would you say Argan oil is the best kind (as opposed to other natural oils such as coconut) to use on frizzy/dry hair? Very excellent post! I used to always use argan oil on my hair but now that I use wash my hair less and use natural shampoo my hair is no longer as dry. I am finding that argan oil works nicely on my skin, especially where I have fine lines!